Our research lies at the intersection of robotics and bionics. We equip robots with dexterous manipulation capabilities and we enable humans to regain their lost dexterity or augment their performance, modeling, designing and controlling new robotics and bionics hardware. 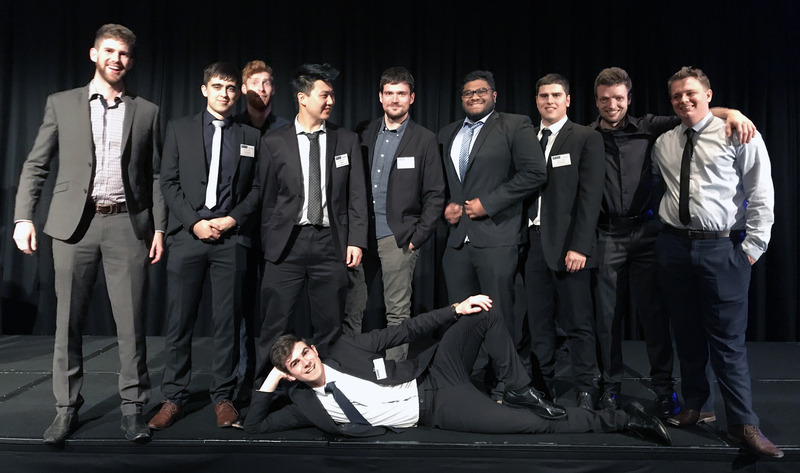 The New Dexterity research group is affiliated with the Department of Mechanical Engineering at the University of Auckland in New Zealand. We always seek exceptional students to expand our team. If you are interested in pursuing a Master of Engineering or a PhD degree, you are encouraged to contact us. A strong background in Robotics or Bionics is required. Please check also the following promotional videos of the University of Auckland. The robot hand presented in the "never stop" commercial (right) is a New Dexterity - OpenBionics prosthetic hand. List of recent news & activities. April, 2019 - Gal Gorjup got the first prize for the best presentation among all 1st year PhD students participating in the 5th Mechanical Engineering Postgraduate Conference of the University of Auckland. April, 2019 - A paper prepared in collaboration with George Kontoudis from VirginiaTech and 2 papers of the team have been accepted for presentation in the EEE-RAS-EMBS International Conference on Rehabilitation Robotics (ICORR) and the 41st Annual International Conference of the IEEE Engineering in Medicine and Biology Society (EMBC'19) respectively. April, 2019 - University of Auckland tops first global ranking to measure institutions' social and economic impact according to Times Higher Education University Impact Rankings. January, 2019 - Three papers have been accepted for presentation at the IEEE International Conference on Robotics and Automation (ICRA) that will be held in Montreal (Canada). December, 2018 - A paper on tendon-driven, adaptive, soft exogloves has been accepted for publication in IEEE Robotics and Automation Letters (RAL). December, 2018 - Minas Liarokapis got a Students' Choice Top Teacher award. He was selected by students as one of the top 15 lecturers of the Faculty of Engineering of the University of Auckland. October, 2018 - A paper on combining analytical modeling and learning to simplify dexterous manipulation with adaptive robot hands has been accepted for publication in IEEE Transactions on Automation Science and Engineering (T-ASE). Project: "Augmented Reality based Humanlike Telemanipulation with a Dual Robot Arm Hand System"
Project: "Autonomous Package Delivery with a New Class of Reconfigurable Drones"
October, 2018 - The New Dexterity research group was a bronze sponsor and an exhibitor of the IEEE International Conference on Robotics and Intelligent Systems (IROS) 2018 (Madrid, Spain). April, 2018- The New Dexterity team is developing a new class of reconfigurable drones for package delivery. April, 2018 - A paper on muscle selection for EMG based decoding of dexterous, in-hand manipulation motions has been accepted for publication in the proceedings of the 40th Annual International Conference of the IEEE Engineering in Medicine and Biology Society (EMBC). Project: "Modeling, Analysis and Development of an Anthropomorphic Robot Hand"
Project: "Development of an Adaptive Robot Hand for Aerial Grasping"
Project: "Learning to Identify Objects with Blind Grasps using a Hyper-Adaptive Robot Hand"
September, 2017 - The New Dexterity research group is a bronze sponsor and an exhibitor of the IEEE International Conference on Robotics and Intelligent Systems (IROS) 2017 (Vancouver, Canada). September, 2017 - Minas attended the IEEE International Conference on Robotics and Intelligent Systems (IROS) 2017 (Vancouver, Canada) and gave 4 talks on adaptive grasping mechanisms. June, 2017 - 2/2 of our papers were accepted for publication in the proceedings of the IEEE International Conference on Robotics and Intelligent Systems (IROS) 2017 (Vancouver, Canada). March, 2017 - The New Dexterity team participates with some new robot hand designs in the Maker's Space exhibition at the digiPlaySpace of the Toronto International Film Festival. February 22, 2017 - Minas organized in collaboration with the University of Auckland General Library and Creative Commons NZ, a workshop with title "Creative Commons licenses and how to apply them". January 16, 2017 - Minas joined the Department of Mechanical Engineering at the University of Auckland as a Lecturer (Auckland, New Zealand). We work on the development of a new family of adaptive, intrinsically-compliant, under-actuated robot hands. We develop methodologies for executing robust grasping in presence of object pose uncertainties or other environmental uncertainties and disturbances (including aerial grasping). We work on the development of hybrid schemes that combine analytical, numerical and learning methods for simplifying dexterous manipulation with simple, adaptive robot hands. We develop haptic object identification methodologies of minimal complexity (e.g., single-grasp, model-free). We work on the analysis and modelling of the post-contact behaviour of adaptive robot hands. We work on the analysis, modelling and development of soft, adaptive exogloves for rehabilitation and human augmentation. We formulate advanced learning schemes for intuitive and simplified EMG/EEG based control of robotic and prosthetic devices. 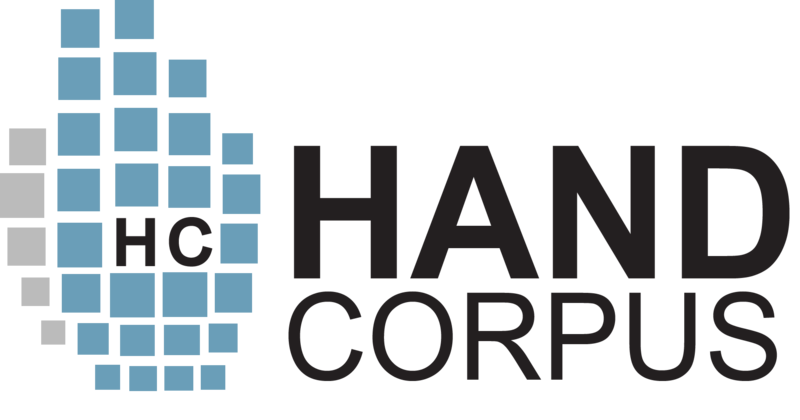 We formulate advanced teleoperation and telemanipulation schemes for robot arm hand systems. We are interested in evaluating the dexterity of human and robot hands, deriving appropriate metrics for design optimization. We are developing a new class of reconfigurable drones for package delivery. Here you can find information regarding our on-going projects. More details can be found in our Github page. A family of adaptive robot grippers and hands for industrial automation and service robotics applications. Body Powered and Electromyography controlled exogloves that are adaptive, tendon-driven, wearable, and soft. An affordances oriented, simple, intuitive telemanipulation framework that facilitates the execution of bimanual manipulation tasks. We create adaptive robot hands and grippers for aerial grasping. List of research papers prepared by the New Dexterity research team. Previous publications of Dr. Minas Liarokapis can be found here. [#13] Lucas Gerez and Minas Liarokapis, "An Underactuated, Tendon-Driven, Wearable Exo-Glove With a Four-Output Differential Mechanism," 41st Annual International Conference of the IEEE Engineering in Medicine and Biology Society (EMBC), Berlin, Germany, 2019. [#12] Geng Gao, Lucas Gerez, and Minas Liarokapis, "Adaptive, Tendon-Driven, Affordable Prostheses for Partial Hand Amputations: On Body-powered and Motor Driven Implementations," 41st Annual International Conference of the IEEE Engineering in Medicine and Biology Society (EMBC), Berlin, Germany, 2019. [#11] George Kontoudis, Minas Liarokapis, and Kyriakos Vamvoudakis, "A Compliant, Underactuated Finger for Anthropomorphic Hands," IEEE/RAS-EMBS International Conference on Rehabilitation Robotics (ICORR), Toronto, Canada, 2019. 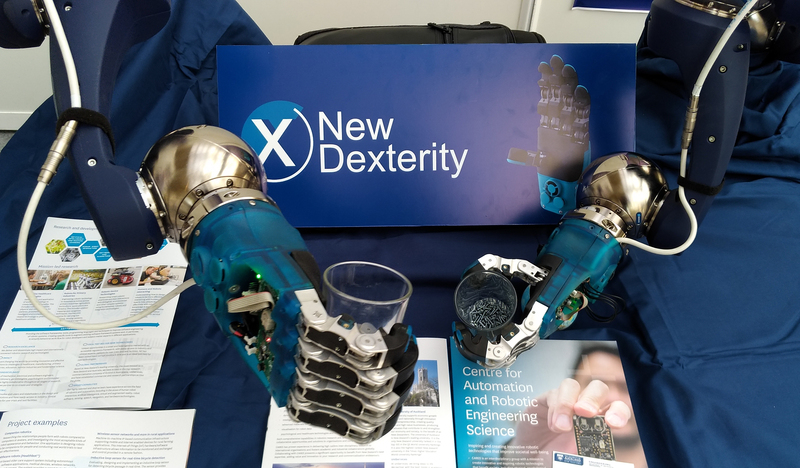 [#10 | PDF | ICRA #3] Geng Gao, Anany Dwivedi, Nathan Elangovan, Yige Cao, Lucy Young, and Minas Liarokapis, "The New Dexterity Adaptive, Humanlike Robot Hand," IEEE International Conference on Robotics and Automation (ICRA), 2019. [#9 | PDF | ICRA #2] Tom Bewley and Minas Liarokapis, "On the Combination of Gamification and Crowd Computation in Industrial Automation and Robotics Applications," IEEE International Conference on Robotics and Automation (ICRA), 2019. [#8 | PDF | RA-L \ ICRA #1] Lucas Gerez, Junan Chen, and Minas Liarokapis, "On the Development of Adaptive, Tendon-Driven, Wearable Exo-Gloves for Grasping Capabilities Enhancement," IEEE Robotics and Automation Letters (RA-L), 2019. [#7 | PDF] Minas Liarokapis and Aaron M. Dollar, "Combining Analytical Modeling and Learning to Simplify Dexterous Manipulation With Adaptive Robot Hands," IEEE Transactions on Automation Science and Engineering (T-ASE), 2019. [#6 | PDF | IROS #3] Zak Flintoff, Bruno Johnston, and Minas Liarokapis, "Single-Grasp, Model-Free Object Classification using a Hyper-Adaptive Hand, Google Soli, and Tactile Sensors," IEEE/RSJ International Conference on Intelligent Robots and Systems (IROS), Madrid, Spain, 2018. [#5 | PDF] Anany Dwivedi, Yongje Kwon, Andrew J. McDaid, and Minas Liarokapis, "EMG Based Decoding of Object Motion in Dexterous, In-Hand Manipulation Tasks," 7th IEEE RAS/EMBS International Conference on Biomedical Robotics and Biomechatronics (BioRob), Enschede, Netherlands, 2018. [#4 | PDF] Lucas Gerez and Minas Liarokapis, "A Compact Ratchet Clutch Mechanism for Fine Tendon Termination and Adjustment," IEEE International Conference on Advanced Intelligent Mechatronics, Auckland, New Zealand, 2018. [#3 | PDF] Yongje Kwon, Anany Dwivedi, Andrew J. McDaid, and Minas Liarokapis, "On Muscle Selection for EMG Based Decoding of Dexterous, In-Hand Manipulation Motions," 40th Annual International Conference of the IEEE Engineering in Medicine and Biology Society (EMBC), Honolulu, HI, USA, 2018. [#2 | PDF | IROS #2] Minas V. Liarokapis and Aaron M. Dollar, "Deriving Dexterous, In-Hand Manipulation Primitives for Adaptive Robot Hands," 2017 IEEE/RSJ International Conference on Intelligent Robots and Systems (IROS), Vancouver, Canada, 2017. [#1| PDF | IROS #1] Minas V. Liarokapis and Aaron M. Dollar, "Learning the Post-Contact Reconfiguration of the Hand Object System for Adaptive Grasping Mechanisms," 2017 IEEE/RSJ International Conference on Intelligent Robots and Systems (IROS), Vancouver, Canada, 2017. Students with * got a Final Year Project award. Students with ** had their research published in a conference paper. Students with *** had their research published in a journal paper. Our research has been funded by industrial partners in Germany, USA and Japan, as well as by the University of Auckland Faculty Research Development Fund and the Center for Automation and Robotics Eengineering Science pilot projects funding. We have considerable experience commercializing our research outputs and we have worked with industrial partners in the field of industrial automation and service robotics. Although we typically work with industry via R&D contracts we also offer consulting services on a case-by-case basis. If you are interested in working with us please contact Dr. Minas Liarokapis (minas.liarokapis@auckland.ac.nz). Powered by w3.css | The New Dexterity group website (www.newdexterity.org) is licensed under a Creative Commons Attribution 4.0 International License.